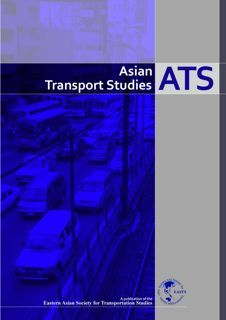 Asian Transport Studies (ATS) is a refereed international journal published by the Eastern Asia Society for Transportation Studies (EASTS). The paper of ATS is an open-access article distributed under the terms of the Creative Commons Attribution 4.0 International License (CC BY 4.0). ATS requires no APC (Article Processing Charge). EASTS, which was founded in 1994, is an international cooperative society of researchers and practitioners from the Asian region. Its primary objectives are to foster and support excellence in transportation research and practice and to stimulate professional interchanges in all aspects and modes of transportation. It organizes an international conference on transportation research every two years. ATS aims at providing useful insights into solving Asia-specific transport-related issues from both theoretical and practical perspectives. It treats all types of transport modes and all issues in the transport sector. Even though papers dealing with the Asia-specific issues are especially welcome, other papers related to transportation studies are also within the scope of this journal. In 2016, ATS started to receive the submission of general (non-conference) papers. We welcome submissions of papers for the publication in ATS at any time. Please submit your paper directly to the Editor-in-Chief of ATS.